Children are taught how to use Montessori materials purposefully. They will be shown how to develop order, concentration and persistence at work by observing the necessary steps/procedures involved in the use of each Montessori material. Our preschool aims to operate in harmony with the natural environment. 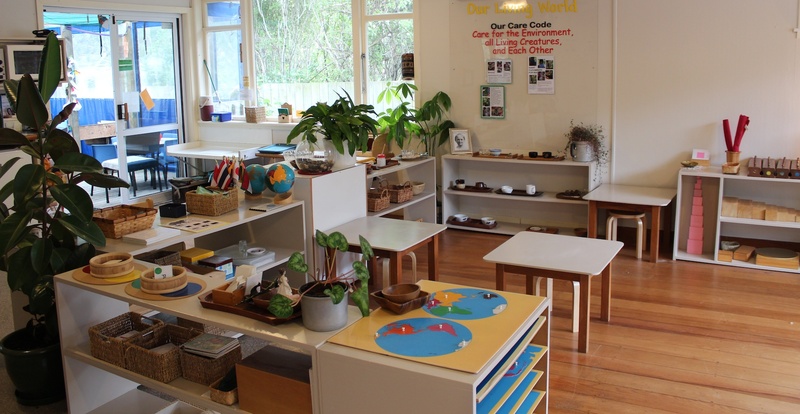 At Tawa Montessori Preschool we have developed a programme with a strong focus on the natural world. Children are given time to interact with nature with the aim of developing their understanding and appreciation of nature and their surroundings. We use the natural environment around us as an extension of the classroom, incorporating gardening, animal care, and recycling. Our unique outdoor environment gives children the opportunity to explore nature first hand. Children can jump in puddles, observe insects, climb on logs, pick apples from our trees, collect eggs from our chickens and plant their own vegetables. Children need these real life experiences to make sense of the world. You won’t find active toys at Tawa Montessori Preschool, ones which perform for you if you push buttons or insert batteries. Instead you will find active children! Children need lots of real life experiences to build up a body of knowledge about the world. The richness of those real experiences lays the foundation for developing the child’s imagination. This is why the equipment in our preschool is real and engaging to ensure that imagination and creativity can happen.